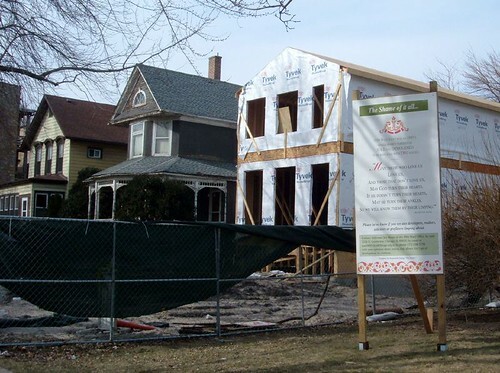 This entry was posted in demolition, Rogers Park, urban planning. Bookmark the permalink. 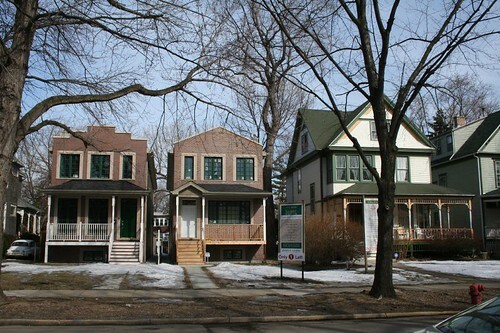 Yes, why would you create a new house that looks old, and then shrink it as if it were embarrassed to be standing next to the older, authentic models? I don’t mind growth, what I mind is tearing down something gorgeous, structurally sound and much more sustainable over something so cheap and ugly looking. None of these houses go with the character of the neighborhood whatsoever. They always look out of place and probably indicate that the person living inside the home is out of place and an outsider as well. On the north side, there was a house next to an alley on Central Park that was 1950s or maybe 60s and very Frank Lloyd Wright-ish type of modern. Goregous home. Structurally sound. What happened? It was torn down to put up two of those ugly things and they just look completely out of place with the character of the neighborhood. The brick is actually a building code thing — “masonry” has been more or less required for several years now, which explains the ubiquity of those awful CMUs.It’s much more difficult to get people to provide positive, forward-thinking visions for their neighborhoods; much easier to reactionarily fight against any change. Such reaction is ultimately neither realistic nor fruitful, but it seems that we’re cynics, conditioned to expect anything new to be awful and ill-conceived. It will take a lot of effort to get the populace to think otherwise.Planners are supposed to take future needs into account when crafting plans and when implementing said said plans (e.g., via zoning), but like many places, Chicago doesn’t do such “forward planning.” We even rewrote the zoning without creating a plan for what the new zoning would do. Honestly, I think the reactionary hatred against “Modern” styles is responsible for much of the quasi-traditional drek that gets slopped up today, and the according fear of anything new (well, that and the auto-centric overscaled crap that gets vomited out along suburban arterial routes.) Most architects can design something in a Modern vein that’s at least nice, and possibly mind-blowingly awesome, but clients, neighbors and developers just aren’t prone to giving them a chance. It’s a shame, because we’re no longer mass-producing buildings that reflect the spirit of our own time.